It’s been a while since I posted under this topic. As some of you know my daughter has been in my shop with me working on things since she was about 4 years old and she turned her first pen at that age as well during a “Turn for the Troops” event. She is now 10 and not working as much in the shop but does find she like to have her workbench still and does still like to turn. 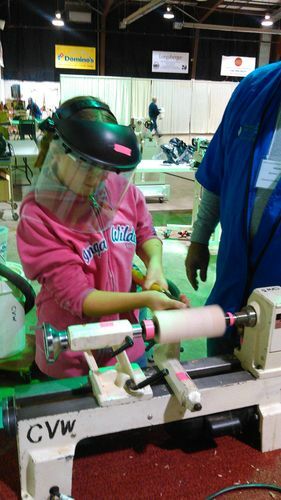 She decided (with very little pressure) that she wold accompany me to the Virginia Woodturning Symposium this weekend. Now we had a great time but I was sorry to see that she met no other kids her age or any other age for that matter there. She was I believe the only attendee under the age of 15 and there were very few 15 to 21 for that matter. Vendors and demonstrators alike were very happy to talk with her and help her. 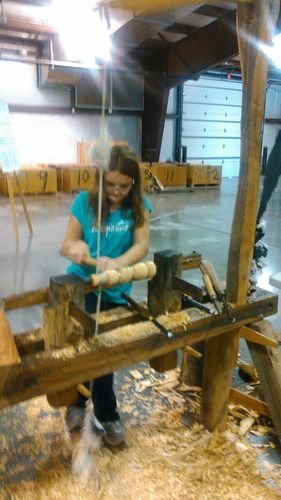 Special thanks to James with the Central VA Woodturners club for helping her turn her first top. This one will be donated to a group going to Haiti that will hand them out to children… A great cause for her as her after school program supports a group that goes to Haiti each summer. An even bigger thanks to Nathan “The Bodging Bigfoot” for helping her to work on the pole lathe, she worked on a captive ring and witha little help was able to get it done. She was extremely happy with herself for being able to work the lathe and get the piece off. 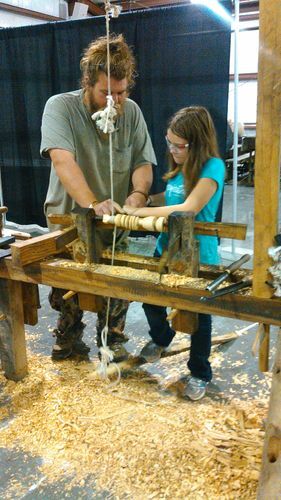 We enjoyed talking with him and and really liked seeing the work that he does on this type of lathe. 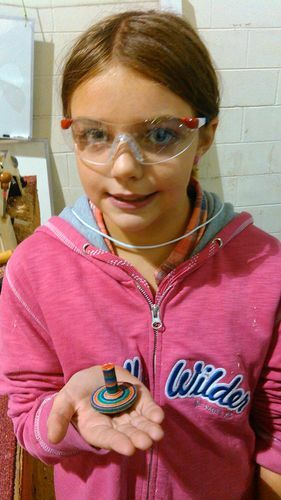 I encourage everyone if there is a child even remotely interested in working with you in the shop or learning more about woodworking of any type. Please take them with you to one of these type of shows or conferences. They may get a little fidgety or bored after a while of watching people talk about making things but there are generally opportunities for hands on projects and from what I have seen numerous times the clubs or mentors absolutely love working with the kids and passing on the skills they have learned to the younger generation. I thanks my grandfather for dragging me around when I was younger to help him fix stuff you just never know the seed that will be planted and how it may grow later. Sophia got a number of pieces of wood and a few new skills from this weekend so I will be planning to get her into the shop in the next few months on a regular basis so she can sharpen those skills and work on things.